I don’t know what the business people have – they have all sorts of crazy numbers, and things to do with shareholders, and things that would probably get me fired. But we’re having a staff pool. I put down my bet: a million within the year, and then three million. GOA and Mythic have got a great track record of doing loads of content for free throughout the life of the product, followed by expansions every year or year and a half. WAR definitely is going to follow the same route. We already have a live team, a core team and an expansion team in the studio right now who’ve been working on all the different elements. They pass my genius test. If you see something, and the first time you see it you end up slapping your forehead and going yeah of course, it’s obvious, whatever it was is probably genius. GOA did it with Dark Age of Camelot and they’ve done it really well. They’ve done it in a very European way, but they’ve done it very well, and it’s more of the same. They know nothing about launching MMOs in Europe, unless it’s spending lots of money closing them down I suppose. It’s funnier than WOW. It’s easier to play, but all the dragons are still left to slay: in WOW, there really isn’t that much to do, not any more. You can wait for two years and get another ten levels, but you’ve probably seen it and done it. If you really, really don’t like MMOs, you don’t like the subscription model, then I’d say stay away, mate. Don’t be a hater. Paul was extremely gracious and charming when we met him at Games Day. He was sitting at a little podium in front of the spooling Warhammer Online trailer that people were staring at, ignoring most of what was going on nearby. A little later, we got the chance to go stand with Paul in the GOA area and chat to him. First of all, we asked him what it was like to be at Games Day where he didn’t need to whip the crowds into a frenzy. He said it was quite relaxing to be a small fish in a big pond for once, and that of course he was used to Games Days since he’d been at Games Workshop for 12 years and attended 8 Games Days. He mentioned how it was interesting to see the game demoed for people who knew the lore extremely well and judged it against that, and how he didn’t need to explain what an Orc was to them at least. And then we chatted a bit about some of our favourite quests in the game and the things we thought people were being impressed by. In an I-Spy point-scoring moment he likened it to trying to show people around your Church while the Pope was visiting the town. A fair estimation of the levels of interest in all things Warhammer vs all things computer game at Games Day. About this time Paul dashed off to teach someone playing a Dwarf how to fire a cannon and we commented that the person probably had no idea who was standing there teaching him! Can you imagine? We got back onto the subject of the quests we enjoyed and the humour in the game. Paul agreed that it had a certain humour element all the way through it, but one which veered very deliberately away from pop culture references, as opposed to World of Warcraft’s way of humourous quests, NPCs and rewards. And we talked also about who the game was aimed at, the fact it was aiming more at the adult audience not because it was an adult game per se, but because 12-year-olds wanted to be treated like adults. Another design choice we think is really appreciated. At this point we were joined by others and the chat just grew more, we did some introductions all round and Paul was very open to chatting to everyone that came over, and signed plenty of stuff. He did keep getting whisked away to speak to people, but each time he’d come back and touch base. Spinks asked about his trousers and he gave us a guided tour of the various patches, some of which he’d done himself, some others had. There was very little jumping about, only a couple of ‘waaagh’s and just a pleasant chat with someone obviously committed and in love with the game we’ve all grown to love. First of all, let me say I haven’t counted up our I-Spy totals yet, though I plan on doing that tonight, so feel free to add your scores here. Who knows, there may be a prize involved (unless we win!). And you can read Games Day as it happened on the bookofgrudges twitter. If you read the Games Day entries, you’ll get a feel for our coach journeys etc, ie. the boring stuff! After coffee we had a look at some of the tables in Hall One, where the Black Library, Forgeworld and Author signings were. Ardua wanted to get some books signed, and I wanted to go look at the new books, so we parted briefly for that. They didn’t have enough cool Games Workshop related T-shirts or jewellery and I realised I’ve ordered them for my work library, so we didn’t buy anything. Then we went to check out the sale area (mostly sold out by the time we got there) and then Spinks checked Forgeworld. We decided to head back to GOA quickly. GOA and THQ were situated in what we referred to as ‘a corridor’, because it was a corridor. The promised Rhino tank was next to the Dawn of War II stand and their trailer was getting a lot of attention. Because GOA had 24 PCs set up where everyone could see them and an orderly queue, it looked like a few less people – but I’d hazard a guess they had just as many if not more. Me and Spinks joined the queue and watched some of the gameplay. The game looked fantastic on the computers and monitors they brought with them. We quickly worked out which computers were linked to the two bigger screens that the queuing people were watching and I nabbed one. Ardua caught with us when we got to play and I made a Squig Herder and did the initial Greenskin quests until the flying bit. I wanted people to see how much fun it was, and a lot of people just picked up whatever char the previous person left. We took a moment to go look at the Games Workshop stands, check out the art competition and also look at the Golden Demon entries. Our favourite was in the diorama category and included some colourful multi-coloured squigs with spots on. (Spinks: I liked the purple one with yellow spots. And the one jumping out of a bush to bite a slayer on the bum. It wasn’t a prize winning entry but it made us laugh. We think they should have a section for comedy dioramas.) But seriously, there are some scarily talented people out there and it was great to see their work. We also went to the Arena and checked out the gaming tables and some of the amazing models and landscapes that were on show. As we returned to GOA, Paul returned and asked if we were ready for an ‘interview’. Ardua, realising we’re complete wimps, had organised this for us! And we went through to the GOA area and stood chatting with Paul in-between him having to dash off and talk to other people. More on what we talked about in a separate post. But he was charming, polite and adorable with his daughter. He also rushed off to help someone in the dwarf starting area who ‘wanted to fire that cannon’ (Paul’s words, but the guy was trying to work out what to do). In one of the in-between times a couple of the people we know from Freddyshouse spotted us and asked the GOA staff if it was us! Incredible! So they came through to stand and chat with us and we got to meet Dervish from Covenant of Zak and Flimgoblin from Humberton Blackguard. Paul came back and there was another round of chat, videoing (if my vidskills are weak, the guys got much better footage I think), signings and hilarity. The GOA staff told us we’d been spotted by a couple more people so we all moved over to chat to them and they were really nice too. Gave them guild details and had a bit of a warm-glow moment in the realisation that real people read the blog. So thanks to everyone who waved or spoke to us, seriously, it was humbling and awesome and you were all so nice! Paul was nabbed for more interviews at some point and we were getting knackered so we went to the Arena to go watch the Golden Demon awards and then find our coach home. Took quite a few photos and I’ll set up a Games Day flickr and just add them all to it, with little editing! Also, my brother-in-law is going to attempt to help me with the video footage I took yesterday and see if he can get it off the camera and show me how to edit it into clips. When that’s done, I’ll put it in our Youtube account. Yes, we have one, but we’ve never had any clips to show until now. I won’t tell you what kinds of things I videoed in case it all went horribly wrong – except to say that there’s some fun stuff in there! Just a quick thank you to everyone we met at Games Day, it was really fun to meet you all and we had a great time. Special thanks to Ardua from Echoes of Nonsense who drummed up our bravery which allowed us to have a great chat with Paul Barnett. And the GOA team – they were awesome, sweet and very helpful. And will be glad to have them as our GMs in-game. I am off to Europe, to games day on Sunday the 14th of September in Birmingham. I will be there all day to wave and say hello. Also in Paris around the 26th of September for the Paris computer show. 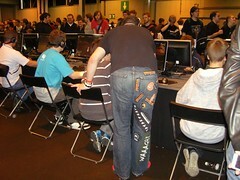 Also in Birmingham the evening of the 27th for PC Gamers LAN show.